I recently installed the iOS6 refresh on my now ancient iPhone 4. I love the new “It’s your call” features, and the new “Do Not Disturb” feature adds utility to my phone as well. I also upgraded my wife’s slightly less ancient iPhone 4S and tried out the features not available on my older iPhone. The turn-by-turn navigation feature is awesome, but I sure wish that was supported on my iPhone 4. The flyby feature in maps is a cool demo, but offers very little value to me as an end user. (I gave up my hang gliding around the Chicago loop past-time when I moved back to the green pastures of W. Michigan.) The panorama feature was nice, but not nearly as impressive as what you can do with Microsoft’s PhotoSynth app (thank you Juan Mejia for pointing this out to me) that has been available on iOS since last May. 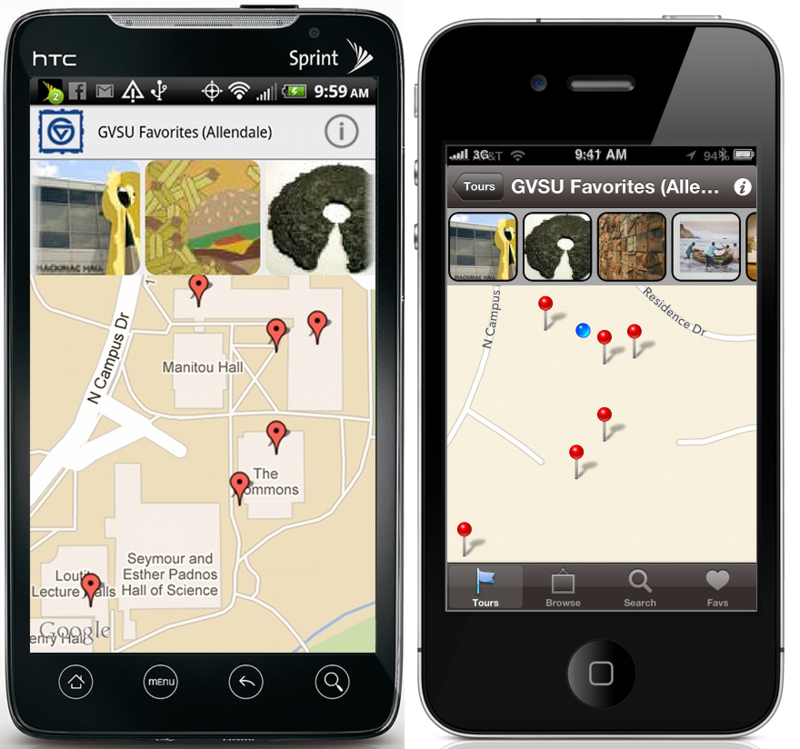 Maps in the Android version of “Art at GVSU” (on the left) compared to maps in the Apple version of the app running on iOS6. Wearing my developer’s hat, my biggest gripe is the lack of quality in Apple’s (Tom Tom’s?) map content. Here at GVSU we have a number of campus apps that utilize map views. For a long time now, Google Maps showed the outlines and names of all of the buildings on GVSU campuses, which was really helpful. For example, our recently published “Art at GVSU” app features a number of campus art tours that help people navigate various collections of art around campus. The art works are all geotagged and Google’s map content made it really easy to find the approximate location of the artwork. With the new iOS6 update, the maps make it look as though campus is a barren desert! (See figure above.). This of course is just the tip of the iceberg, there are a few other blemishes that need some attention as well. We’re used of Apple playing games just to extract more $$ from our wallets (e.g. limit certain features to newer models only that could be adequately supported on older phones). Apple’s stock price indicates most of us don’t have a problem with that. What we are not used to getting from Apple is an altogether inferior product! Given all the chatter on this issue out there, hopefully the folks in Cupertino have gotten the message and improvements are on the way. If not, we always have the shiny new Google Maps app for iOS to look forward to.